Part of the cottage originally formed the end section of a small aisled hall built in the 13th century with later additions from the 1600s to date. Whilst retaining its charm and character, it has been sensitively refurbished/restored in recent years to provide very attractive accommodation. One of the more recent additions is an oak veranda on the side of the property which provides a very pleasant place to sit with a cup of tea or glass of wine! The cottage is situated on a quiet lane with views over the grounds of a large country house. There are several footpaths near to the cottage and easy access to the South Suffolk Cycle Route. Bathroom with roll top bath and overhead shower, WC and hand basin. A pretty country kitchen with electric oven, dishwasher, microwave, fridge with freezer section and toaster. Stoke by Nayland Golf Course and County Club, 12 miles approx. Notes on accommodation: No smoking inside the property. Sorry, no pets. Working dogs very welcome. Central heating included in the price. Welcome basket. Games and books provided. Outside: Good sized walled garden. Garden furniture. Private parking for two cars on hard standing at the front of the property. Utility Room: Washing machine located in out house. Cleaning / Towels / Linen / Quality white linen & fluffy towels are included. The property is thoroughly cleaned, and linen & towels changed, at the end of each letting period. Other: Secure storage for bikes. We were warmly welcomed by Lorna and David to this charming cottage packed with history. Staying here really does feel like you stepped back in time but with all the modern creature comforts. The house was warm and well equipped. 4 adults and 2 children fit well in this house and it felt like a home away for home, albeit only for 3 days. Such a peaceful place to stay and comfortable too. We would definitely return. The cottage is within 40 minutes driving time of the Essex coast. The Suffolk and Norfolk coasts are options for day trips. 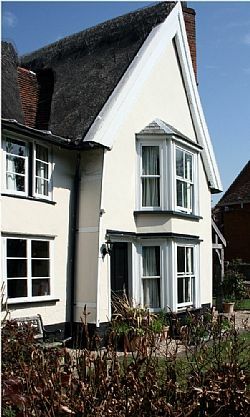 The cottage is a 45 minute drive from Stansted Airport and approx. a three hour drive from the Port of Dover. A car is essential. Foxearth is very close to Long Melford, explore Melford Hall, a large Elizabethan House, Kentwell Hall, a grand and romantic Tudor mansion, with reinactments. Lavenham, an historic medieval village is 7 miles away. The villages of Melford and Lavenham are famous for antiques and both provide interesting days out. In addition, Bury St Edmunds, a Georgian town with Cathedral 15 miles away. Cambridge, university town 35 miles away. Newmarket Race Course and Stud 35 miles away. Melford and Lavenham, selection of pubs and quality restaurants, 5-15 minute drive. Foxearth Church, 3 minute walk from cottage. The market town of Sudbury, 4 miles away, a selection of supermarkets and banks, also a public swimming pool and the Key Theatre. Family Days - Colchester Zoo; Colchester Castle and Museums - an historical adventure through some of the most important events in British history; Imperial War Museum, Duxford, Cambridgeshire; Hollow Tree Farm, Hadleigh, Suffolk - children's farm; Thetford Forest, Norfolk. As well as Melford Hall, other NT attractions include, Ickworth House, Horringer,Bury St Edmunds, Suffolk - house, park and gardens; Anglessey Abbey, Lode, Cambridgeshire - elegant house, gardens and working watermill; Orford Ness National Nature Reserve, Orford, Woodbridge, Suffolk - wild and remote shingle spit, largest in Europe; Blakeney National Nature Reserve, Norfolk; Hatfield Forest, nr Bishop's Stortford, Essex - medieval hunting forest. An excellent farm shop, Willow Tree Farm Shop, can be found 2 miles away. It stocks a wide selection of local produce, with fresh fish available on Saturdays. Booking Notes: Short breaks are available, minimum number of nights 3. 3 night weekend break, Fri, Sat and Sunday - 70% of weekly rate charged. For additional nights, contact owner for price. 4 night midweek break, Mon, Tues, Wed and Thurs - 60% of weekly rate is charged. For additional nights, contact owner for price. Changeover Day: 7 night break - Friday or Saturday 3 night break - Friday 4 night break - Monday Please contact owner to enquire about a different start date. Notes on prices: Please see pricing table or email owner for price.